It’s always exciting when you see the Google Maps car drive past you on the street. Maybe you’ll be able to spot yourself on street view afterwards. 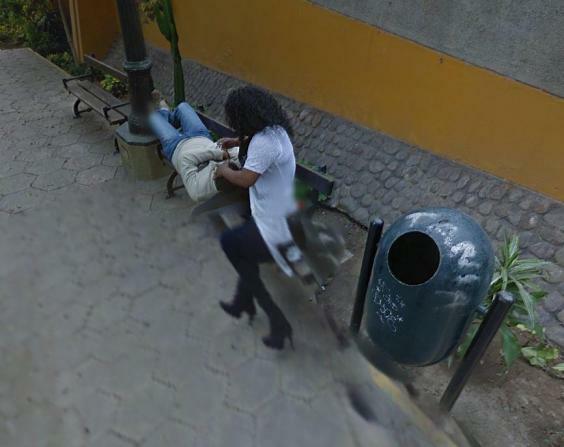 We doubt that was the case for this Peruvian woman, who has since become a divorcee after being seen cuddling up to another man on Google Street View. This took place way back in 2013 at Puente de los Suspiros de Barranco in Lima, Peru. The image, which is still on Google, shows a woman sitting on a bench with a man lying down next to her with his head rested on her lap. The Daily Mail reports that the woman’s now ex-husband recognised the clothes that she was wearing and eventually realised it was her. The unnamed couple later divorced after she was confronted about her adultery, which she confessed to. The husband later shared the images on Facebook where the woman was berated for her dishonesty. Let this be a lesson to all of us: be careful what you are doing out on the street. You never now when a major tech company might be taking pictures of you.